It’s back to school around here on Monday, so you will see several posts related to that in the next little bit. Today I’m talking about Back to School shopping, and the crazy way I turned inexpensive notebooks into customized works of art for my kiddos! Every year I’m a bit overwhelmed by the length of the back to school supply lists we get from the schools! 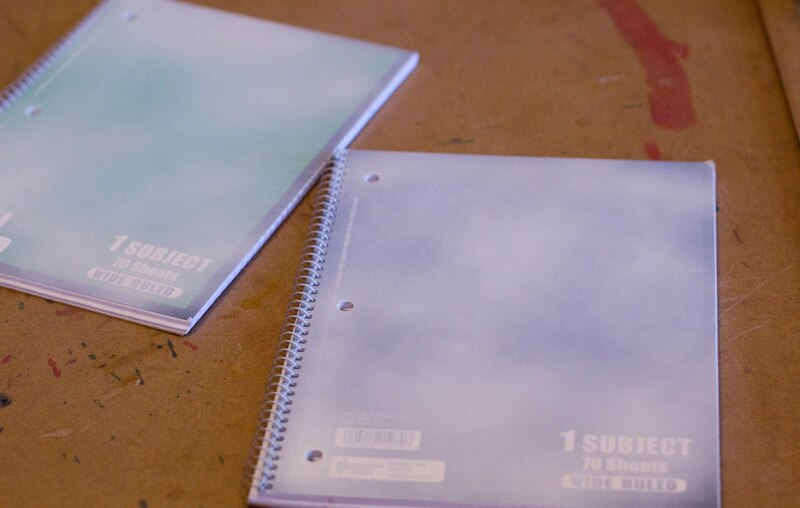 I cut costs by buying things on sale and stuff like the plain $0.20 notebooks from Walmart, instead of the pretty $4.00 ones. 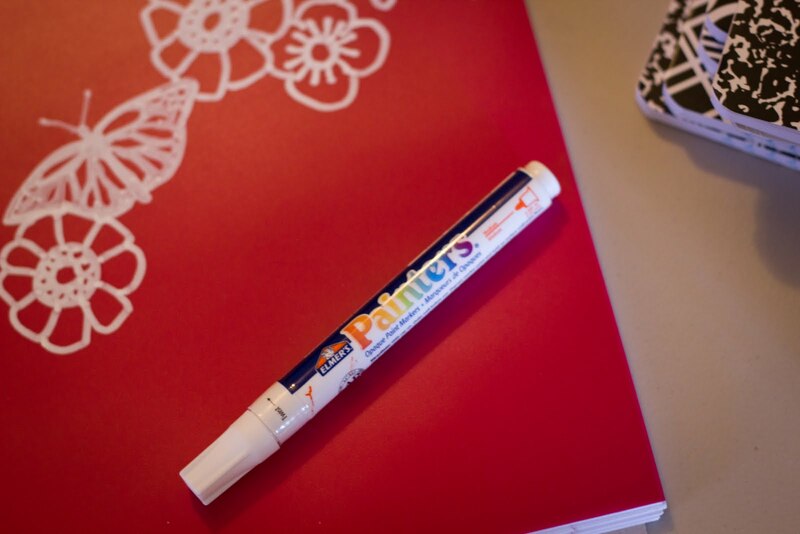 But being the visual and crazy person that I am–feel that even school supplies should be an artistic expression of who I am my children are! Enter Elmer’s Painters Markers. You remember we discovered these at the Elmers Craft and Tell party I hosted. They are great fun and mark on almost everything. 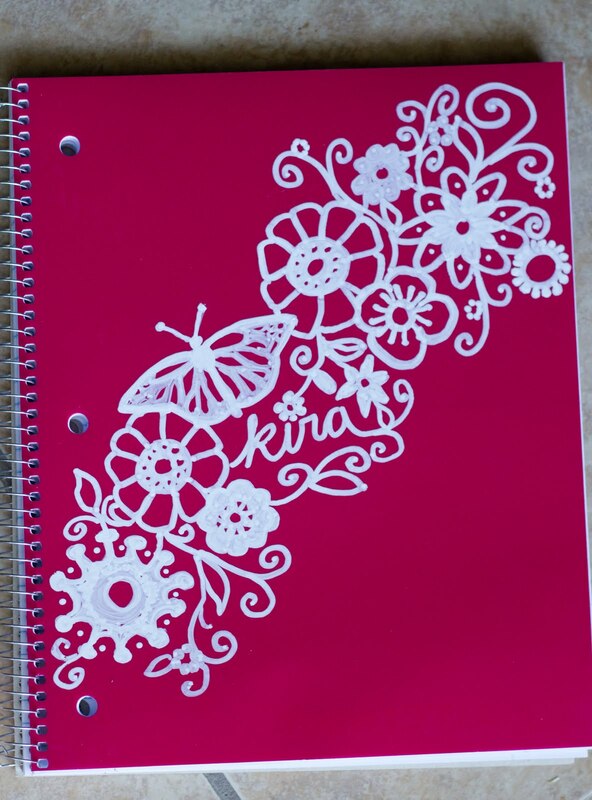 I started with just a white painter pen, and a pink plastic-cover notebook from Walmart ($1). I cut a design I found on the Silhouette library that I was going to use as a stencil, but decided it would be simpler to freehand it. I did use that design as inspiration. It looks a bit like lace and I wanted the same effect. The trick is making sure the elements were all touching. I started with the butterfly, then the large flowers, then began filling in with leaves and swirls. 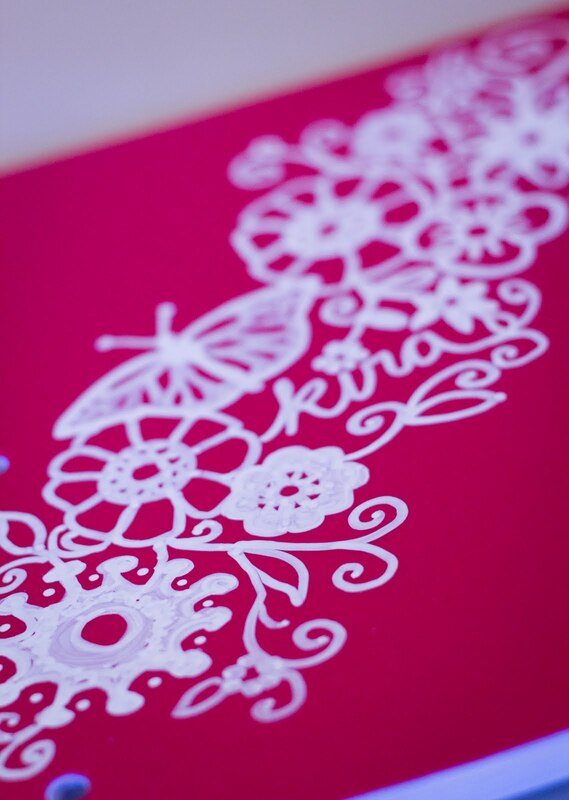 I wrote my daughter’s name in cursive and connected it to the vines and such, so that it would blend into the lace. Do you think she will get her notebook mixed up with anyone elses? But just a really light coat of a cheap white paint that I had on hand. The paint made a cloudy appearance that inspired the design for my son’s notebook. I sketched out a cityscape at the bottom of the notebook, strategically covering the remains of the words and barcode. With the light spray paint coating, the painters worked like a charm. 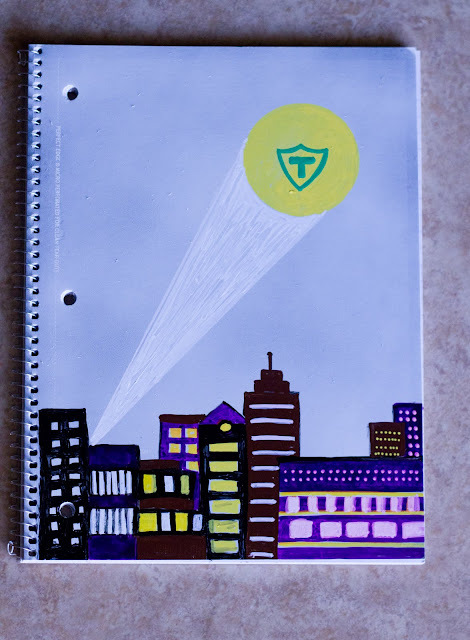 My son is thrilled with his Superhero style notebook, featuring his initial as the Superhero symbol. 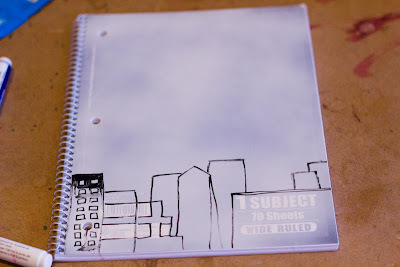 Not too bad for a $0.20 notebook. And more interesting than black Sharpie marker, right? This could be fun to do with the kids before school starts (if you aren’t being as picky about the design) to get them excited about the school year! 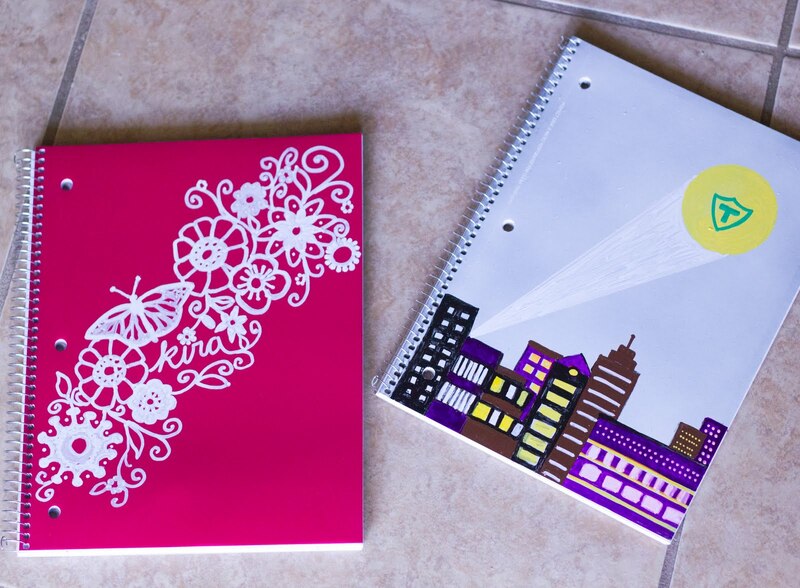 Do you have strong feelings about school supplies, too? Cheapest or cutest? What do you go for? This project has been compensated as part of a social shopper insights study for Elmer’s #gluenglitter #collectivebias, but the opinions and insanity are purely my own! Those turned out amazing! I love that you made 2 distinct styles. How cool, I bet your kids love them! These are absolutely gorgeous. I love how you used the paint pens. Now I'm on a mission to find them in my neck of the woods. I decoupage the composition books to use for my graduate school classes – no one but me sees them, but they certainly cheer me up.